So How’s That Whole NFL-in-the-U.K. Thing Going? The best big-man defenders have a sense of timing and space that borders on basketball genius — an understanding of when to give help, how far to slide over, when they’ve helped enough, and how the other nine players are about to move around the floor. Serge Ibaka hasn’t developed that kind of sense, and whether he does so might be the single biggest variable that will determine the balance of power in the NBA over the next three to five years. It was true before the James Harden trade, and it’s probably even more true now: Ibaka is the most important player in the league. The Thunder have made a long-term bet that two wings and one big man is a better big-money core than three wings and a patchwork of cost-effective bigs. The Harden–Russell Westbrook–Kevin Durant trio would have always presented some redundancies, but they are all more or less sure All-Star talents. Ibaka, despite the astounding shot blocks and bogus runner-up finish in last season’s Defensive Player of the Year voting, isn’t at that level. He has to at least approach it for the Thunder to remain title contenders this season and going forward. Let’s be clear: Ibaka is not a poor defender or even an average one. He’s better than that, and last season he became more effective and disciplined in the post, and in containing pick-and-rolls on the perimeter. But he is prone to helping too much, and, more damaging, helping for a couple of beats too long. That can make him late recovering to shooters on the perimeter, and it adds a layer of confusion to a Thunder defense filled with young players already prone to breaking from core “on a string” defensive unison. If one player is late, a teammate might take up his assignment, opening a hole elsewhere and creating chaos, with multiple defenders rushing in a panic at the same shooter. All of this came to a head against Miami in the 2012 Finals, when the Thunder defense failed both in lineups big (with Ibaka and either Kendrick Perkins or Nick Collison) and small (with just one of the three). The Thunder figure to play small more often with uncertain depth beyond that trio, and Collison loses a bit of his utility upon the departure of Harden, with whom he formed one of the game’s most lethal pick-and-roll combinations. Both these stills capture the Thunder defense in crisis, only they don’t realize it quite yet. 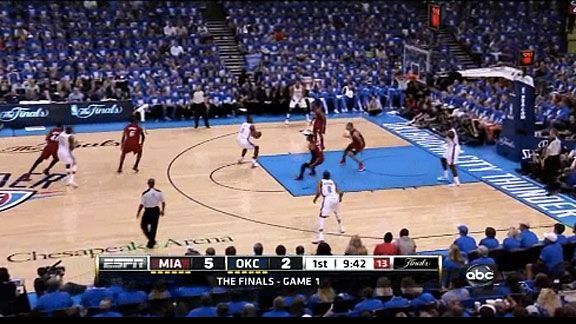 In each, the Thunder are overloading down low to stop a Dwyane Wade drive; you can see Ibaka’s blue no. 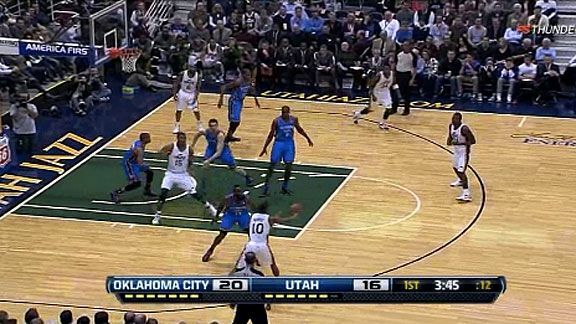 9 jersey in the first image, and he’s standing just above the block/charge circle in the second. The basic idea is right; aggressive help schemes are part of every NBA defense now, and teams have to protect the rim above all else. But the use of space is problematic. Ibaka is too close to his nearest teammate, and the Thunder as a result are not in position to deny passing lanes across the court to Ibaka’s man (Shane Battier). If one thing separated Miami from Oklahoma City last season, it was the way Miami’s players moved together on the court to make just about every option difficult. The Thunder weren’t ready to do that, and the issues obviously go beyond Ibaka. 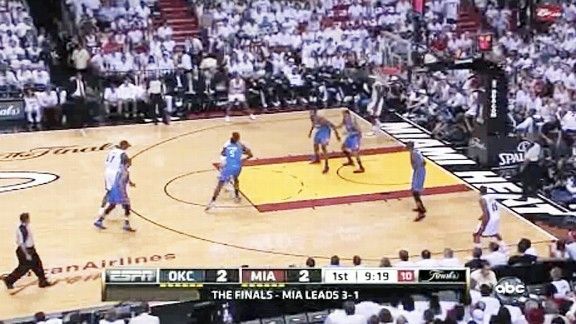 Other Thunder players were often unsure of how and when to rotate around the court after an initial breakdown, leaving holes for smart teams. Experience will help, but Ibaka is the one player with game- and franchise-changing potential in this regard. The Thunder ranked 11th in points allowed per possession last season, and they held the high-powered Spurs to league-average production over the final four games of the conference finals. The potential is there; Ibaka is the player most likely to unlock it. Watch the best big-man defenders — Tyson Chandler, Andrew Bogut, Kevin Garnett, Dwight Howard — and you’ll notice an economy of movement that is really something, considering the speed of an NBA game. They recognize immediately, almost before it happens, the moment at which their help has contained an initial opponent action, and it is thus time to return to their original assignment. They are already beginning their retreat, shifting their momentum, at the split second the ball handler on a pick-and-roll picks up his dribble. 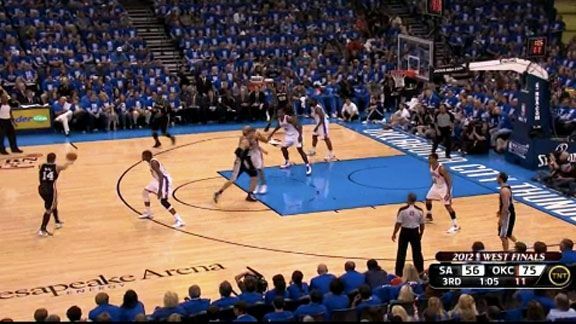 The issues extend to the perimeter, where Ibaka can be unsure of himself in covering the weak side. 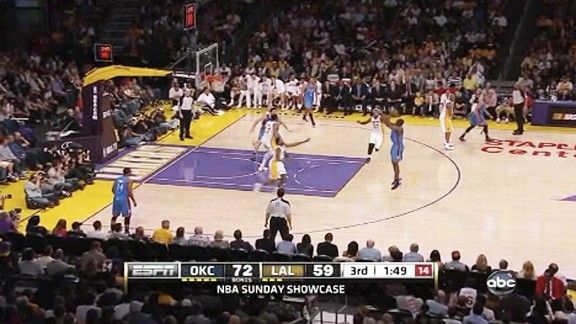 In the below still, for instance, the Thunder are overloading the left side of the floor in response to a Steve Nash–Marcin Gortat pick-and-roll that has ended up with Nash passing to Shannon Brown in the left corner. Ibaka is late to shift into the space halfway between Channing Frye and Jared Dudley as Durant abandons Dudley to help in the paint, perhaps because Ibaka understands Frye (his man) is an elite shooter. But the gap leaves the skip pass from Brown to Dudley, who would hit a 3 on his possession as both Ibaka and Durant ran out at him — leaving Frye unguarded for a potential second pass. 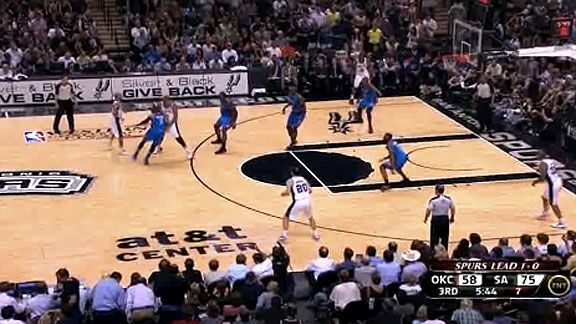 Ibaka’s astounding athleticism allows him to make up for a lot of these half-step errors. It’s actually scary how much ground he can cover in a blink. These same help-and-recover skills will aid Ibaka in becoming an even more fearsome rim protector. Combine that athleticism with a deeper understanding of NBA defensive nuances, and Oklahoma City might be able to build a top-five overall defense. And again: It’s not all on Ibaka. Everyone has to get better, both individually and as a team. But he’s the one with the highest impact ceiling, both because of his own athleticism and because he’s a big guy. His development is especially important if Oklahoma is going to play small, with Kevin Durant at power forward, more often. The need for progress also exists on offense, though less urgently, since this is Oklahoma City’s strong end. Still: The Thunder reached their greatest scoring heights with Harden, Durant, and Westbrook on the floor, and now Harden is gone. They’ll have to get that extra punch someplace else, and squeezing a more diverse pick-and-roll game from Ibaka could be one such place. About 18 percent of Oklahoma City’s possessions last season ended with a pick-and-roll ball handler finishing the play via a shot, drawn foul, or turnover, per the stat-tracking service Synergy Sports. That’s a big number relative to the league average. But only 4.5 percent of their possessions — a tiny number — ended with the roll man in a pick-and-roll finishing the play. Combined, that was the biggest ball-handler/roll-man split in the league. Ibaka made himself more available as a pick-and-roll target last season, but he’s still in the early stages of developing into a consistent weapon in this way. He prefers to pop out for jumpers up top or along the baseline, and while he’s a very good mid-range shooter, these are suboptimal looks that don’t place a ton of stress on defenses. 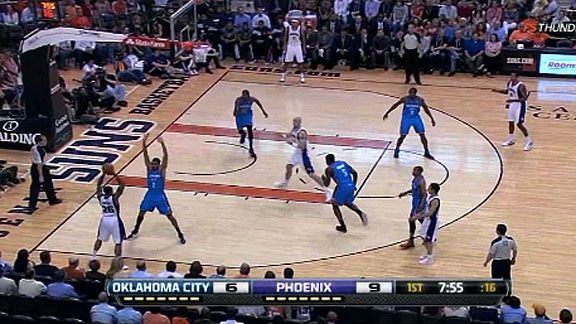 And Ibaka can be weirdly hesitant to take them, letting openings slip away. This should also come with experience. Timing a cut to the rim so as to create a workable passing lane is an art, especially when the guy with the ball (i.e., Westbrook or Durant) is a young score-first player still learning the nuances of passing on the move at this level. Westbrook and Durant have made great strides as passers, with room for much more. And in a bit of good news, Ibaka never really developed a great pick-and-roll chemistry with Harden, in part because Collison was the perfect partner for Harden. Ibaka and Durant have a decent chemistry on very high pick-and-rolls, and Westbrook likes to run them with Ibaka at the foul line area — closer to the rim, so that Ibaka’s jumpers and cuts have to cover less distance. This wouldn’t be as much of an issue if Ibaka were more comfortable catching in this area, taking a hard dribble, and exploding to the rim. He’d get more free throws doing that, and he showed flashes of this kind of game in the playoffs, including a nifty pump-fake-and-drive move that fooled both San Antonio and Miami a few times. But this stuff is in the early stages. Ibaka barely gets to the line at all; among 75 players who finished at least 50 possessions as the roll man in a pick-and-roll, only eight drew shooting fouls less often than Ibaka, according to Synergy. This is the hard work of the NBA — rounding off less noticeable skills through repetition, experience, film study, and coaching. Dunking is fun; this is boring. Ibaka is already a very good player, and the Thunder are already a very good team. They’ll have to develop into something more to challenge Miami, and Ibaka represents the best path there.